And you know what? The old drunkard was spot on! With Lisa away, I’ve been able to do something good for the frail Australian environment and leave the car in the garage most days. Yes, I often ride when she is here, but she still drives (likes to look good and smell nice at work, silly girl), so the car is still making that 16 km trip traverse from the southern to northern extremes of Wagga. But what Hemingway didn’t elaborate on was that you not only get the contours of the country, but the sights, sounds and smells. It is on a bicycle that you really get to know where you live, and the more you do a ride, the more precisely you get to know those characteristics. So now, because I need something to write about and the most interesting thing I have done this week is ride my bike to work (not as pathetic as it sounds! ), here’s a bit of a description of the ride from Hilltops to the CSU Wagga campus that people in a car or bus can’t experience. 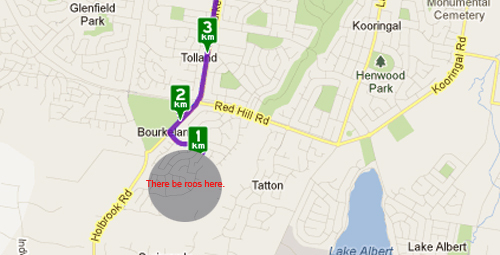 I won’t get as detailed as I could – I know every pot hole and magpie on the route – but just an overview of my commute. Nothing too eventful here, just some roos and friarbirds. Will be nicer when it isn’t unseasonably cold in the mornings. Leaving home is pretty much a standard suburban ride…unless you are a Canadian living in Australia and kangaroos make you giddy! Because this morning, and many mornings, there are kangaroos on our street. What a great way to start a day! The first two kilometres have a few undulating hills, but mostly they undulate down, so it is a quick ride into an older treed neighbourhood that is full of birds. Yes, some of them are magpies (grrr!) but there are also always flocks of parrots and honeyeaters and cockatoos that make me smile. Hemingway’s ‘sweaty part’ comes at about 4 km, a bit of a hill up Bourke Street toward Fernleigh Road (details of interest to those who know Wagga), and the more I ride it the stronger my legs so it is becoming noticeable. The most worst part of the ride, the only one that is even slightly worrisome (and only slightly). But at least if I get hit here I am near a hospital. Back down it though…well, unlike Hemingway, I don’t coast. This is an opportunity to fly, and I usually get up over 50 km/h over the next 2 km (Fernleigh to Edward). This is a bit of a scary section though, because the street is very (VERY!) bumpy and there is a lot of traffic. And stupid things like roundabouts and train tracks and a hospital that generates a lot of traffic… I like to be through this area by 7:30 before it gets busy. After that, a pleasant jaunt through central Wagga, old neighbourhoods with wide (flowering) tree-lined streets lined with nice houses with beautiful gardens full of birds. A place to go fast, but also to enjoy the surroundings. As much as I like this area for its flatness, one day a couple weeks ago I was riding with someone and we were discussing how much we both hate it! Partly because you feel like you are getting nowhere, and partly because you know what is coming next. Next up, North Wagga. 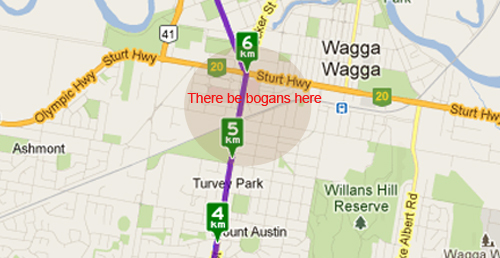 People who know the area or were reading the blog last February and March will know that North Wagga is a flood plain. That, in bicycle terms, is a good thing: flat! Yes, there is a stretch where you just don’t seem to be getting anywhere because the only landmarks are cows, but overall it is a great ride, and a nature lover’s paradise. In the 8 or 9 minutes it takes to ride though N Wagga, there will be an assortment of ducks, a variety of parrots, some egrets, herons, kites, kestrels, kookaburras…maybe even some pelicans! And cows, sheep, horses…things that make a ride pleasant. And magpies, though swooping season might be over. Not only a hill, but this area has killer magpies! But pretty nice way to start the ride home. After this flat, however, comes the final climb to work. The last couple of kilometres to campus it isn’t a steep climb, not one you would actually notice in a car (well, maybe that first hill coming up to Boorooma Street…) but the worst gradients are the ones you don’t see! A short steep hill, no worries! A long slow one wears you down. If this was early in the ride, it wouldn’t be so bad, but after just pushing myself to the limit for 30 minutes, the last bit is a killer! Recently, I’ve done some of the group rides, such as NSW bike day and Australia Ride to Work day, and because those are more of a fun event, I’ve been less worn out and the hill didn’t seem to be as noticeable. But on the solo days, when my goal is to see I can beat my best time (all recorded in a really great iPhone app called Cyclemeter), I’m dead by the end of the ride! Maybe I am going at this all wrong; if I paced myself better earlier on I’d probably have more oomph left for the last bit. But in case anyone reading this is thinking of starting to ride to work (uh, Lisa…) it really isn’t that bad. Lots of people do it at a saner pace than I do! The trip home is pretty much a mirror image – down, flat, up – but with its own quirks. You can get going really fast leaving campus. But for some reason, Wagga is almost always windy in the afternoon, so the N Wagga flat can get a bit interesting. Today, for example, sustained winds of almost 35 k and gusts in the 45 range made it a bit wobbly! And Wagga is a lot busier on the way home, so the roundabouts in central, around Gurwood and Trail streets, for example, require a lot of attention. Going home they are right turns, so third exit, whereas the mornings are all left turns (one exit…much safer). And if school is in, there is a really dangerous spot where parents picking up their kids angle park on Gurwood Street (which, with its canopy of trees, is otherwise beautiful)…please look before you back out into traffic! If you can’t see that extremely bright flashing light on my bike, not to mention the big guy in a bright red jersey, maybe you shouldn’t be driving! And if you can see me, don’t do anything you wouldn’t in front of another car; this is a school zone, with a 40 k speed limit and I am going almost as fast as a car here! But the consequences, for me, are much worse if you do something stupid. Then, the great morning downhill becomes a less pleasant afternoon uphill. First is the hospital area, where the street is a narrow and there are always parked cars (note to drivers getting into their cars: please don’t open your door to get in when I am coming toward you. Would you do this if I were another car? Probably not!). This is also where I occasionally have some idiot yell at me from their car that I am in their way! It is usually either some guy in a tricked-out ute with roo bars or a woman in an SUV, neither of which make any sense in a city, and all who probably think that bicycles are for kids. Well, they aren’t – they are for people who are interested in the environment, in fitness, and just having fun (safely and legally). In the morning there are a lot of parrots in this section. The problem here is that I do it on a service road and there are a lot of ‘traffic calming’ things…like it just keeps ending and I have to go onto footpath for a few metres. Annoying. Safe, but annoying. Then there is the hill…less steep but longer going south. But I’m getting better at it, as my legs get back into shape after a sedentary winter. Today, I only geared down two gears…which is probably as good as it will get because the roundabout at Urana and Bourke, ½ way up the hill, is busy and there is no way I will whip through it at full speed (well, I did that on Sunday morning but it is too busy on a weekday afternoon). And then from Fernleigh I head back downhill, onto a service road and then a trail into Bourkelands, undulating up to home. The odd thing was that from our rental house in Kooringal, I could get home faster than I could get to work (30 minutes there, 29 home). Hilltops, on average, 37 minutes going and 38 back home. But really, the length of time of the commute isn’t a worry, because I can’t think of many better ways to spend an hour a day. 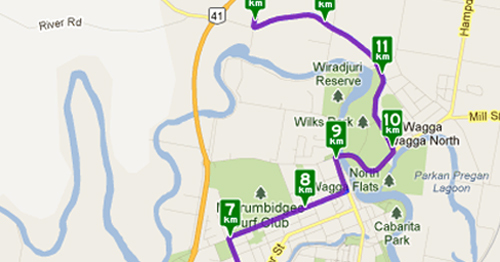 Yes I do it for the environment and for my health, but really I do it because riding a bike through Wagga is fun. I just want to get it down to under 35 minutes each way. Or 34. Maybe 33…or I could just relax a bit and not be killed by those hills at both ends. This entry was posted in bicycle, cycling, magpies, parrots, rural life, Uncategorized, wagga, wagga wagga, wildlife and tagged bicycles, bike safety, cycling, wagga. Bookmark the permalink.